After five days of seaside camping (“Catfish by the sea“), it was time to take our Airstream Safari home and thoroughly wash off the sea salt. It was also time to relax and think about a little summer reading and cooking something fun. Last summer I made the Sonoran hot dog. This season I’ve been inspired by Dr. C’s Insight out article, “Schmoozing Rhubarb,” a slice of Americana à la Charles Kuralt and Garrison Keillor, written after Dr. C and his family visited Lanesboro, the Rhubarb Capital of Minnesota, during the Rhubarb Festival held on the first Saturday of every June. According to Wikipedia, rhubarb is a plant that has been grown in China for at least 5,000 years and used there as a laxative. It was imported to Europe during the 14th century via the Silk Road and first came to the United States in the 1820s. Its leaves are poisonous, but its fleshy rose-red petioles (stalks) are cooked and used in pies. 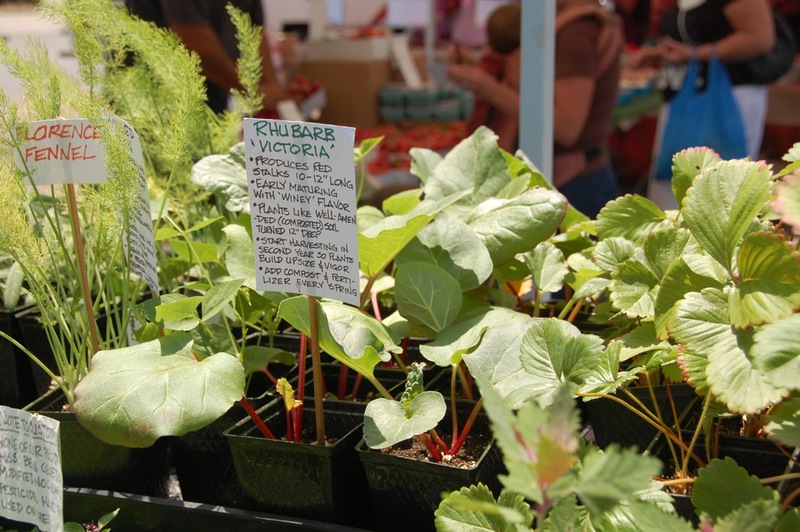 My search for rhubarb began with a visit to our favorite local farmers’ market in Hillcrest, San Diego. I only found small plants for planting. It seems the rhubarb season in Southern California is relatively short. 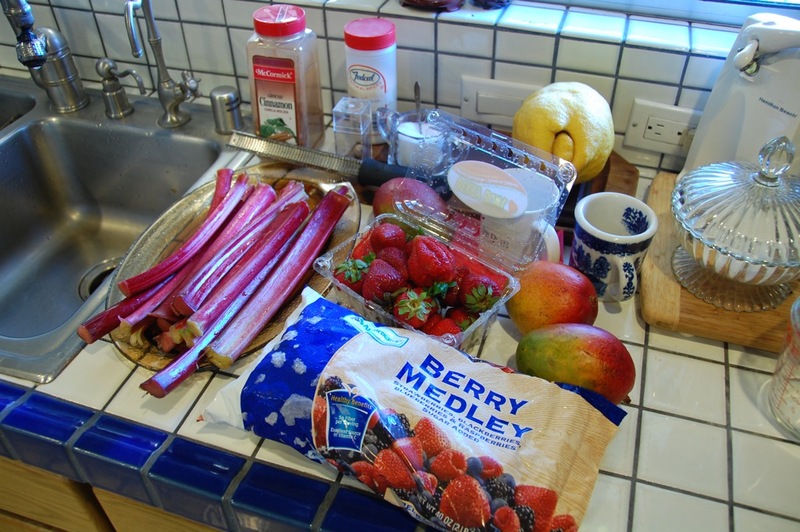 I sliced each rhubarb lengthwise making three strips that I diced into 1/2″ pieces. 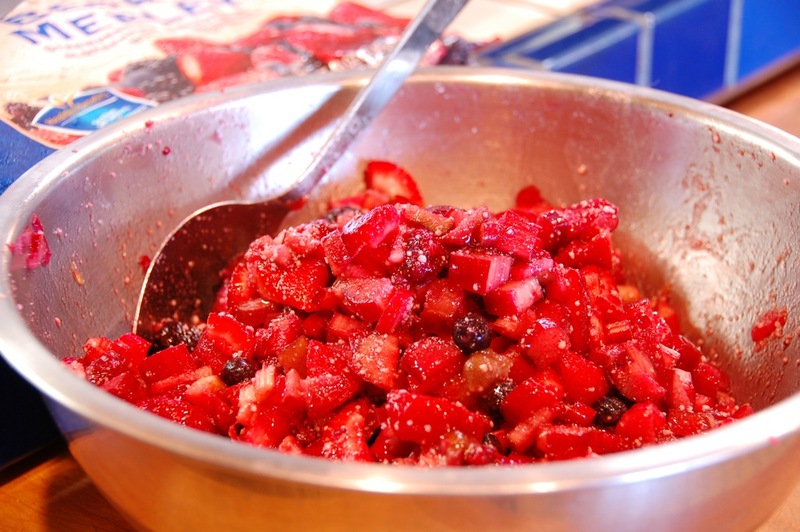 Then I sliced the strawberries, which were combined with the rhubarb in a large mixing bowl and I stirred in a mixture of 1 cup white sugar, 1 cup brown sugar, 1/2 cup tapioca, 1 tsp. lemon zest, 1 tsp. cinnamon, 1 tsp. vanilla extract, 1 tsp. grated nutmeg, a dash of salt and a dash of triple sec. This was allowed to rest for 15 minutes while I preheated the oven to 425°. 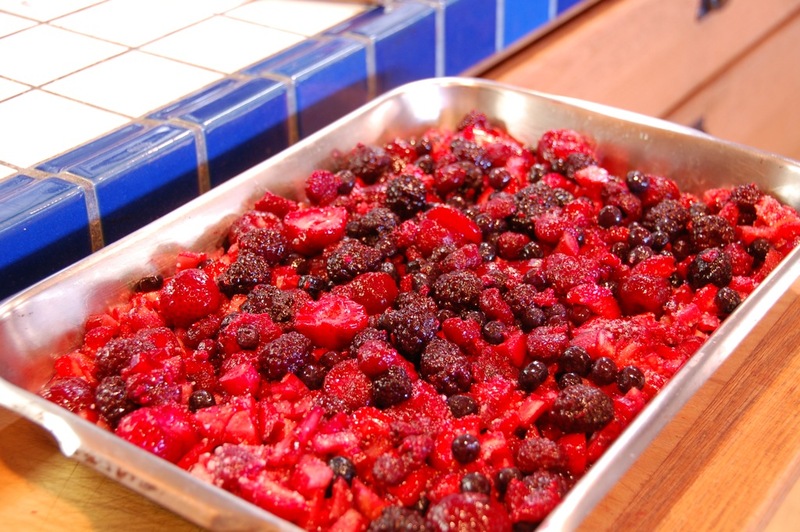 The mixture was then placed in a 10″x15″ baking pan. 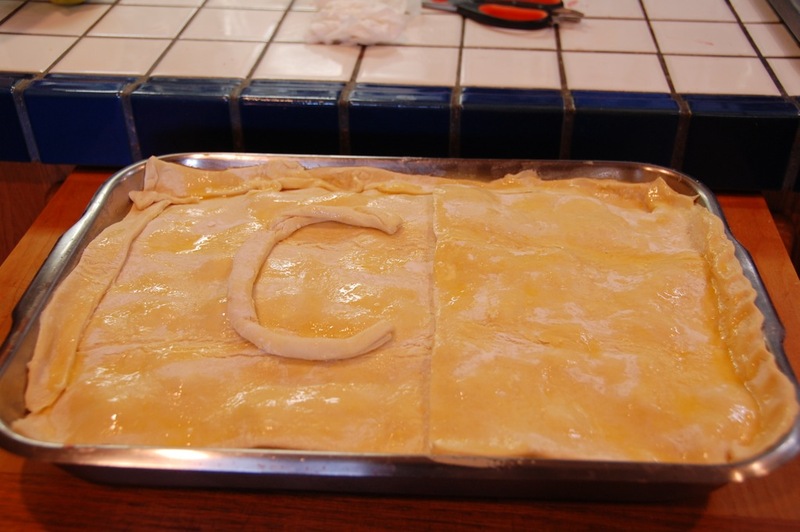 I then added the puff pastry, which was brushed with egg (for a golden crust) and I added the letter “C” in honor of Dr. C, the writer of “Schmoozing Rhubarb”, which inspired this project. 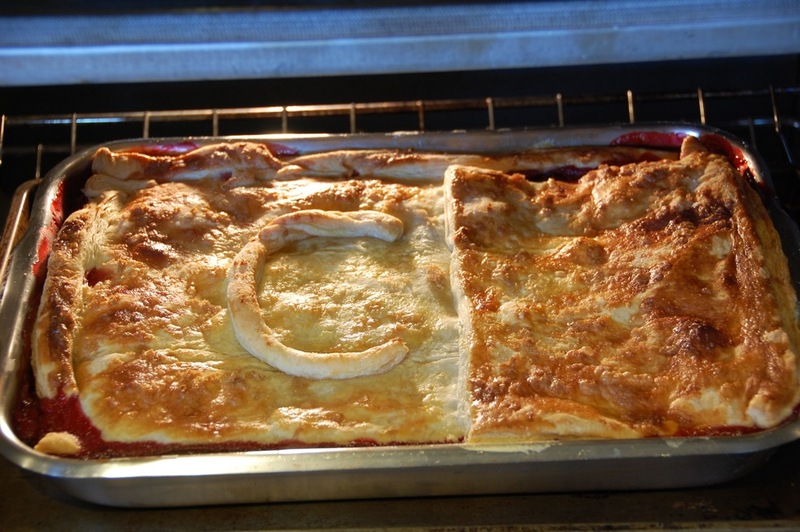 This was then placed in the oven and cooked for 15 minutes at 425° and for another 45 minutes at 350°. It was taken out of the oven and allowed to cool for about 30 minutes and then sliced and served with French vanilla ice cream… Delicious! 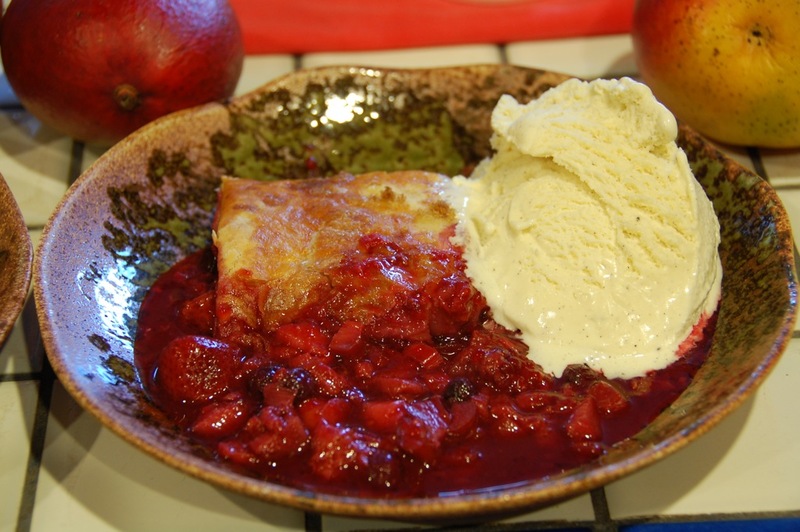 Yes, this would be a great time for a piece of rhubarb pie… and to listen to “The Rhubarb Tart Song“!